Real wood mantle made by Amish Craftsmen. No particle board or MDF. Cool Touch vent technology keeps the fireplace cool to the touch - The air is hot, the fireplace is not. Hybrid-Thermic? Heat Technology exclusively by Heat Surge. An internal mini-furnace generates a revolutionary thermic heat that safely warms both you and the air around you. 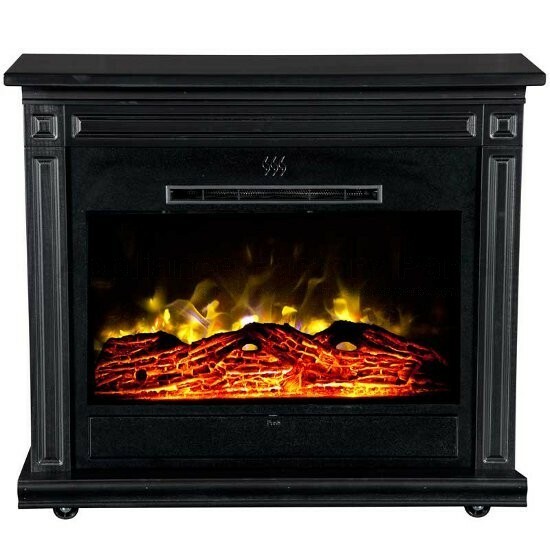 The most realistic flame yet with Hi-Def Fireless Flame technology powered by energy saving and maintenance free LED lights. No smoke, No fumes, No mess, No vent. Saves money with lower heat bills using zone heating. Integrated caster design ensures easy maneuverability. Crackle Sound Effect - Enjoy the sound of a real fire; a feature that can easily turned on or off. Customizable comfort with a thermostat control. Fully functional remote control with batteries included. Fully assembled - Just plug it in. 6-foot cord; 15 amp internal breaker; Tip-over switch; Reset switch; UL approved for the USA and Canada. High heat setting = 1,500 watts / 4606 BTU's Heats an 18' x 18' room, like a family room (Hybrid-Thermic). Standard heat setting = 750 watts / 2,300 BTU's Heats a 10' x 12' room, like a bedroom (Hybrid-Thermic). Dimensions 29.25"w, 25.75"h, 9.5"d, Weight 40lbs. We're adding new HS-30000526 parts all the time, contact us for pricing and availability.